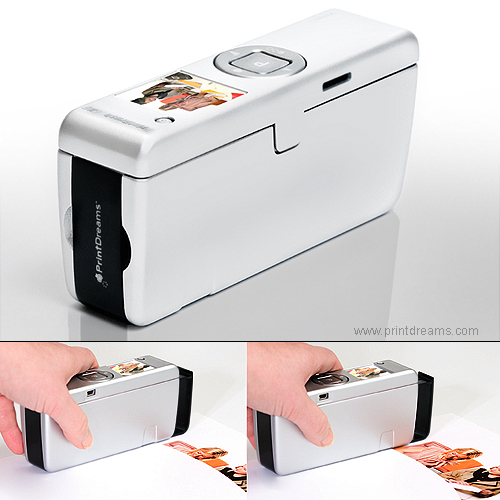 The PrintBrush 4X6 is an handheld RMPT ink-jet printer, with a built-in digital camera, able to print in colour (600 dpi) directly onto virtually any flat surface, including paper, plastic, wood and even fabric. The Random Movement Printing Technology (RMPT)** is achieved by random movements with freedom of motion vertically, horizontally, diagonally and with rotation of the printing device without interference with the final result. 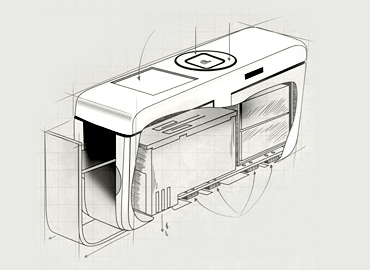 As the user slides the PrintBrush across a sheet of paper, a 3DOF (Degree Of Freedom) optical navigation sensor (OptoNav™) tracks the velocity and direction of the printer relative to the page. A controller matches the location coordinates to a pixel map of the document or image and runs algorithms to predict which pixel to print next. PrintDreams RMPT™ Full technology has very high performance regarding speed, acceleration and stability. Printer features include a colour LCD 1.4” display, a µSD memory card slot, a micro USB interface and a 5M pixel digital camera with auto focus and image processing. ** Essentially human-powered and software driven, RMPT printers have very few mechanical components and not a single electric motor as compared to conventional printers. It is estimated that the global adoption of this technology in other printer categories could represent an annual saving of 325,000 metric tons of raw materials and 291 terawatt/hours of electricity. Technology video of the PrintBrush showing a fully functional laboratory prototype.